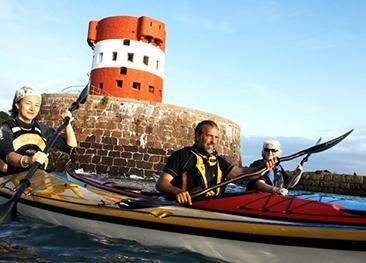 Discover Jersey's offshore reefs, caves and bays, and possibly spot some dolphins! 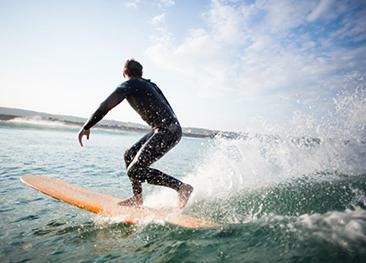 Jersey Seafaris offer a completely unique way to explore Jersey and its surrounding waters. From an exhilarating R.I.B ride, to a glass of champagne on a deserted beach or zipping across to France for dinner, Jersey Seafaris offer something for everyone and make a great addition to your trip to Jersey. 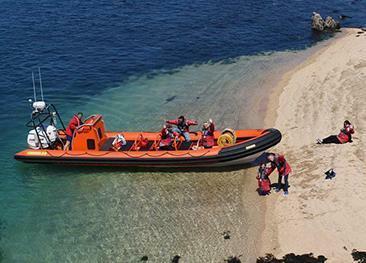 Jersey Seafaris provide regular boat trips, tours and charters around Jersey’s beautiful coastline and offshore islands, giving you the chance to experience one of the biggest tidal ranges in the world and discover hidden wonders around every corner. Jersey Seafaris offer a number of boat tours to different destinations throughout the week, including Les Ecrehous, Les Minquiers, Iles Chausey, Sark and France. You’ll be able to learn about the local marine life on an Ecrehous Wildlife Tour, discover the little-known Iles Chausey, explore Sark’s stunning coastline with a Sark Seafari or stay a little closer to home to admire Jersey’s beautiful scenery and secluded bays on one of their South Coast or Sunset Tours. On any of the Jersey Seafaris excursions you may be lucky enough to witness some of the wide variety of marine life that resides along Jersey’s rocky coastline and surrounding waters. Sightings of dolphins and seals are common on Jersey Seafaris and you’ll have the chance to observe and learn about the fantastic birdlife around Jersey’s shores, which includes puffins, fulmars, colonies of shags, oystercatchers, waders, gulls and wildfowls. Jersey Seafaris take the conservation of this area very seriously and follow the Jersey Marine and Coastline Wildlife Watching Code. The price of your tour includes your very own commercially endorsed RYA qualified skipper and provision of life jackets and waterproofs if necessary. Food and drinks can also be arranged courtesy of The Boat House group, who are happy to provide deluxe picnic hampers starting at £15 per person. Each hamper includes a selection of the best local seasonal produce, and can cater for individual needs. Jersey Seafaris also offer private and commercial charters, enabling you to relax and enjoy a trip to the destination of your choice without the hassle of organising your own boat. Visitors to Jersey can find out more at www.jerseyseafaris.com.